In the sci-fi world, radiation is synonymous with super powers. Peter Parker became Spider Man thanks to an overzealous radioactive spider, and when a group of scientists were bombarded by radiation in space, they became the Fantastic Four. In the real world, however, radiation is viewed a bit differently. If radiation means “super powers” in other worlds, then it means “cancer” in our world. Technically, radiation is defined as the transmission of energy in the form of waves through a medium. Ionizing radiation is traditionally thought of as radiation and includes x-rays, gamma rays, and some forms of ultraviolet light. This type of radiation has the most energy, and even has the ability to alter the structure of atoms in our tissues! Nonionizing radiation, on the other hand, carries much less energy and includes radio waves, microwaves, and heat. Have you ever hugged a friend and felt their comfy 37-degree body heat? Well, your buddy is literally emitting radiation. That’s kind of a super power, right? But usually when you hear the word ‘radiation’ it has a negative connotation and refers to something in the ionizing category. Nuclear power plants, which harness ionizing radiation from decaying radioactive materials, are often viewed as ticking time bombs. Many fear disasters like Chernobyl and Fukushima, and some believe that even living near nuclear power plants will severely alter their health. These views are not completely unsupported by scientific research. For example, one Australian study conducted in 2013 suggested that the incidence of cancer in patients who had been exposed to ionizing radiation (in the form of CT scans) was 24% higher than those who had not been exposed to radiation. Those who feel strongly about these issues are not afraid to voice their opinions. Just this month, thousands of protesters marched in Lianyungang, China to convey their opposition to construction plans for new nuclear power plants in their city. Unsurprisingly, their views are representative of most of the general public: nuclear power plants bring radiation, and radiation brings cancer. The end. But is this view really accurate? A comprehensive review published this year in the journal Genetics suggests that the effects of radiation to the human body may be less severe than commonly thought. Although the atomic bombings in Hiroshima and Nagasaki were horrific, they did allow researchers to extensively study the effects of excessive radiation exposure to humans over time. Studies conducted by the Radiation Effects Research Foundation (RERF) began in 1947 and tracked the lifelong health of around 100,000 survivors of the attacks. Popular opinion would tell us that these survivors had a drastic increase in the incidence of cancer. However, cases of cancer in these survivors only increased an average of 10% when compared to the general public between 1958 and 1998, which translated to an average reduction of 1.3 years of the survivors’ life expectancy. As a comparison, your life expectancy drops 7 years if you are clinically obese and over 40 years old! Still, no scientist will tell you that exposure to radiation is a good thing. A 10% increase in your chance of developing cancer is still an increased risk. However, misunderstandings about radiation and nuclear power can hinder developments in addressing global climate change. As public opinion of nuclear power worsens, more and more money is taken away from nuclear power and given to sources of renewable energy like solar and wind. This is a big issue because nuclear power is the primary source of zero-carbon electricity in the United States. Unlike fossil fuels, the production of energy by radiation does not release large amounts of carbon dioxide into the atmosphere. You know those pictures of nuclear power plants with smoke billowing out of their smoke stacks? That’s actually steam! Nuclear power is also more reliable than solar or wind energy, which can vary from season to season and year to year. There’s only one problem with nuclear power: radioactive waste. Do nuclear power plants also produce radioactive byproducts? Yes, of course. But are you going to be affected by that radiation? Probably not. Nuclear power plants produce energy by harnessing the heat given off by decaying radioactive elements. When these elements are too stable to produce heat for energy, but are still decaying and releasing radiation, they are considered wastes. After being held in a controlled environment, some of the wastes can be released into the environment in regulated, negligible amounts. Air, food, and water supplies around nuclear power plants are sampled regularly to ensure the plant is following guidelines set by the Nuclear Regulatory Commission. All in all, radiation and nuclear power gets a bad rap. Our long-held stigmas against radiation and its dangers should be addressed when trying to mitigate global climate change; especially because nuclear power may represent a good bridge between renewable and nonrenewable energy. These new findings suggest that even high exposure to radiation does not drastically increase your chance in developing cancer, let alone super powers. Sorry about it, Peter Parker. 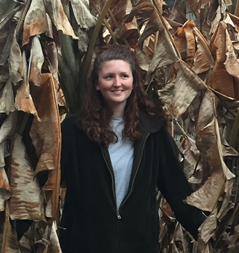 Ellen Krall is an undergraduate at UGA studying Plant Biology. When she’s not in classes or at the lab, she enjoys long walks in the State Botanical Garden, being kind of good at several instruments (violin, ukulele, banjo), and naming her Beta fish after famous scientists. More from Ellen Krall.